A previously unknown species of human that lived at the same time our ancient ancestors were colonising Europe has been discovered in the Philippines. 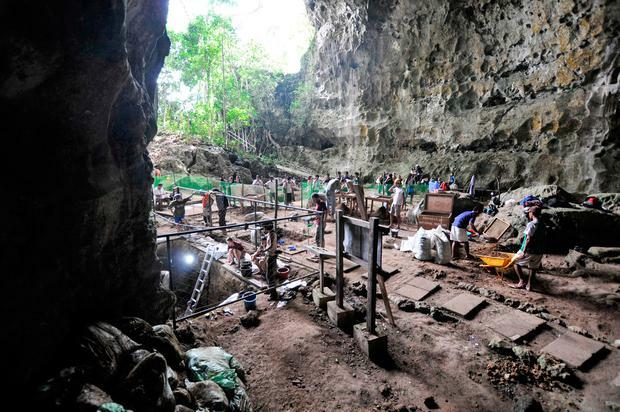 Bones and teeth of the "hominin" were found in Callao Cave on Luzon, the largest island in the Asian archipelago. They contain a mixture of old and new features that have excited scientists and threaten to overturn accepted theories of human evolution. Several feet and hand bones, a partial thigh bone, and teeth from at least three individuals were unearthed and dated to the late Pleistocene era, as recent as 50,000 years ago. The teeth are unusual. While the molars of H luzonensis were strikingly small - similar in size to those of modern humans - they shared other characteristics with those of far more primitive hominins, including one known for its massive jaws and teeth. One of the foot bones had an anatomy distinct from all other known hominins, including modern humans. It also had primitive-looking fingers, and the fingers and toes were curved - suggesting the creature liked to climb. Writing in the journal Nature, Dr Florent Detroit, from the Museum of Natural History in Paris, France, and colleagues conclude: "The discovery of H luzonensis underscores the complexity of the evolution, dispersal and diversity of the genus Homo outside of Africa, and particularly in the islands of south-east Asia, during the Pleistocene." All species of human, both living and extinct, are believed to have originated in Africa. They moved out in two major waves of migration hundreds of thousands of years apart. The sole representative of the first wave was thought to have been Homo erectus, which spread across the globe more than 1.5 million years ago. However, this theory has looked shaky in recent years, especially with the discovery in 2004 of H floresiensis, and the latest find throws up even more doubts.